I grew up in the heart of Tokyo, Japan. After finishing BA in Tokyo, I taught in different national contexts, Vancouver (Canada), Bangalore (India), Tokyo (Japan), and Madison (USA), teaching primary, middle school and college students, adults and pre-service teachers. I was awarded the Fulbright Fellowship (2002-2005) to undertake a doctoral study at the Department of Curriculum and Instruction, the University of Wisconsin-Madison (USA). Soon after completing the degree, I joined the Social Contexts Teaching and Research Group at the University of New England in February 2008. In 2010, I was awarded the George Bereday Award from the Comparative & International Education Society (USA), and I currently sit on the editorial board for Asia Pacific Journal of Education. I teach and coordinate a wide range of undergraduate units related to sociology of education, curriculum studies, multicultural/antiracist education and comparative & International education. All the higher degree research students who are currently under my supervision are undertaking sociological studies of education policy both in and outside Australia. 2) globalization of educational knowledge and research. The first is to understand the changing nature of education policy context that is simultaneously de-territorialized and re-territorialized and the emerging policy phenomena associated with this change. In particular, I am interested in the increasing prominence of transnational organizations such as OECD, the emergence of new actors in education policy making and the implications of these to educational governance and equality. The second focus concerns my exploration of different ways of engaging with educational scholarship produced outside the English-using academic communities around the world. Being a bi-lingual and bi-discoursal researcher, I draw upon my knowledge of Japanese education scholarship to denaturalize the common sense of educational scholarship in the English-using scholarly communities. In so doing, I am attempting to articulate a dialogic space in educational research where different research traditions and epistemologies are recognized as epistemic resources to push the existing boundaries of educational knowledge. In my mind, these two focuses are closely intertwined as the second always forces me to be reflexive about the particular body of knowledge that I draw upon in order to participate the academic discourse authorized in the English-using education scholarship. As the list of publication below should show, I have published a range of articles in scholarly journals and more popular outlets both in English and Japanese in the fields of comparative & international education, education policy and sociology of education. Takayama, K. (2017) Imagining East Asian education otherwise: Neither caricature, nor scandalization. Asia Pacific Journal of Education 37 (2): 262–274. Takayama, K. (2017) Putting 'Fast Policy' in dialogue with the policy borrowing and lending scholarship in comparative education. Discourse: Studies in the Cultural Politics of Education 38 (2): 292-298. Takayama, K., Sriprakash, A., & Connell, R. (2017) Rethinking knowledge production and circulation in comparative and international education: Southern theory, postcolonial perspectives, and alternative epistemologies. Comparative Education Review 61 (S1): 1-24. Gulson, K., Lewis, S., Lingard, B., Lubienski, C. Takayama, K., & Webb, T. (2017) Policy mobilities and methodology: A proposition for inventive methods in education policy studies. Critical Studies in Education 58 (2): 224-241. Takayama, K., Jones, T., & Amazan, R. (2017) Thinking with/through the contradictions of social justice in teacher education: Self-reflection on NETDS experience. The Australian Journal of Teacher Education 42 (4): 84-96. Takayama, K., Heimans, S., Amazan, R., & Maniam, V. (2016) Doing Southern theory: Towards alternative knowledges and knowledge practices in/for education. Postcolonial Directions in Education 5(1): 1-25. Takayama, K. (2016) Beyond ‘the West as method’: Repositioning the Japanese education research communities in/against the global structure of academic knowledge. Japanese Educational Research Association’s Educational Studies in Japan: International Yearbook 10: 19-31. Takayama, K. (2016) Deploying the post-colonial predicaments of researching on/with 'Asia' in education: A standpoint from a rich peripheral country. Discourse: Studies in the Cultural Politics of Education 37(1): 70-88. Takayama, K. (2015) Provincializing and globalizing the World Culture theory debate: Critical insights from a margin. Globalisation, Societies and Education 13(1): 34-57. Waldow, F., Takayama, K., & Sung, Y. (2014) Rethinking the pattern of external policy referencing: Media discourses over the ‘Asian Tigers’’ PISA success in Australia, Germany and South Korea. Comparative Education 50(3): 302-321. Takayama, K., Waldow, F., & Sung, Y. (2013) Finland has it All? Examining the media accentuation of 'Finnish education' in Australia, Germany and South Korea. Research in Comparative and International Education 8(3): 307-325. Takayama, K. (2013) OECD, ‘key competencies’ and the new challenges of educational inequality. Journal of Curriculum Studies 45(1): 67-80. Takayama, K. (2013) Untangling the global-distant-local knot: The politics of national academic achievement testing in Japan. Journal of Education Policy 28(5): 657-675. Takayama, K. (2012) Exploring the interweaving of contrary currents: Transnational policy enactment and path-dependent policy implementation in Australia and Japan. Comparative Education 48(4): 505–523. Takayama, K. (2011) Other Japanese educations and Japanese education otherwise. Asia Pacific Journal of Education 31(3): 345-359. Takayama, K. (2011) 格差社会における教員養成・教科教育学への一考察：オーストラリア・ニューサウスウエールズ州の事例から [Reimagining teacher education and curriculum research in time of rising social inequalities: Lessons from New South Wales, Australian teacher education]. 日本教科教育学会誌 [The Bulletin of Japanese Curriculum Research and Development] 34(3): 47-54 (in Japanese). Takayama, K. (2011) A comparativist's predicaments of writing about 'other' education: A self-reflective, critical review of studies of Japanese education. Comparative Education 47(4): 449-470. Takayama, K. (2010) ナショナリズムと公教育―戦後的論争からの決別のすすめ [Toward a new debate on nationalism in public education]. 公教育計画学会創刊号 [Special Edition, The Society for Public Education Planning] 1(1): 28-51 (in Japanese). Takayama, K. (2010) Politics of externalization in reflexive times: Reinventing Japanese education reform discourses through ‘Finnish success.’ Comparative Education Review 54(1):51-75. Takayama, K. (2009) Globalizing critical studies of ‘official’ knowledge: Lessons from the Japanese history textbook controversy over ‘comfort women.’ British Journal of Sociology of Education 30(5): 577-589. Takayama, K. (2009) Is Japanese education the ‘exception’? Examining the situated articulation of neoliberalism through the analysis of policy keywords. Asia Pacific Journal of Education 29(2): 125-142. Takayama, K. (2008) The politics of international league tables: PISA in Japan's achievement crisis debate. Comparative Education 44(4): 387-407. Takayama, K. (2008) Japan's Ministry of Education ‘becoming the right’: Neoliberal restructuring and the Ministry's struggles for political legitimacy. Globalisation, Societies, and Education 6(2): 131-146. Takayama, K., & Apple, M. W. (2008) The cultural politics of borrowing: Japan, Britain, and the narrative of educational crisis. British Journal of Sociology of Education 29(3): 289-301. Takayama, K. (2008) Beyond Orientalism in comparative education: Challenging the binary opposition between Japanese and American education. Asia Pacific Journal of Education 28(1): 19-34. Takayama, K. (2007) A nation at risk crosses the Pacific: Transnational borrowing of the U.S. crisis discourse in the debate on education reform in Japan. Comparative Education Review 51(4): 423-446. Takayama, K. (in press) PISA, Tiger parenting, and private coaching: The discursive construction of ‘the Asian’ in globalised education policy field. In G. Vass, J. Maxwell, S. Rudolph, & K. Gulson (eds) Relationality of race and racism in educational research. London: Routledge. Takayama, K. (2017) 日本における批判的教育学・教育研究の歴史と展開：批判的知の脱西洋化に向けて[A history of critical pedagogy and education research in Japan: Towards de-westernization of critical thoughts]. In A. Nagao & M. Sawada (eds) 批判教育学辞典 [Handbook of Critical Education Scholarship] (pp. 423-439). Tokyo: Toshindo (in Japanese). Takayama, K. (2016) Towards de-cold-war politics: Nationalism, democracy and new politics of/for education in Japan. In E. Reimers & L. Martinsson (eds)Educational and Political Subjectivities: Emergences of Norms and Possibilities. New York: Routledge. Takayama, K. (2016) Provincializing and globalizing critical studies of school knowledge: Insights from the Japanese history textbook controversy over ‘comfort women.’ In L. Lim & M. Apple (eds) The Strong State and Curricular Reform: Assessing the Politics and Possibilities of Educational Change in Asia (pp. 161-179). New York: Routledge. Takayama, K. (2016) Exploring the interweaving of contrary currents: transnational policy enactment and path-dependent policy implementation in Australia and Japan. In J. Schriewer (ed) World Culture Re-contextualized: Meaning Constellations and Path-Dependencies in Comparative and International Education Research (pp. 99-117). New York: Routledge. Takayama, K. (2014) Global ‘diffusion,’ banal nationalism, and the politics of policy legitimation: a genealogical study of "zest for living" in Japanese education policy discourse. In P. Alassutari & A. Qadir (eds) Routledge Advances in Sociology, National policy-making: Domestication of global trends (pp. 129-146). New York: Routledge. Takayama, K. (2012) Bringing a political 'bite' to educational transfer studies: Cultural politics of PISA and the OECD in Japanese education reform. In G. Steiner-Khamsi & F. Waldow (eds) World Yearbook of Education 2012: Policy borrowing and lending in education (pp. 148-166). New York: Routledge. Takayama, K. (2011) Re-conceptualizing the politics of Japanese education, Reimagining comparative studies of Japanese education. In D. Blake & J. Rappleye (eds) Reimagining Japanese Education: Borders, Transfers, Circulations, and the Comparative (pp. 247-280). Oxford: Symposium Books. Takayama, K. (2010) From the Rightist ‘coup’ to the new beginning of progressive politics in Japanese education. In M. W. Apple (ed) Global Crises, Social Justice, and Education (pp. 61-111). New York: Routledge. Takayama, K. (2009) Progressive struggle and critical education scholarship in Japan: Toward democratization of critical education studies. In M. W. Apple, W. Au, & L. Gandin (eds) International Handbook for Critical Education (pp. 354-367). New York: Routledge. Takayama, K. (2009) オリエンタリズムの影を越えて: グローバル化時代における比較教育学への批判的アプローチ (Beyond the legacy of Orientalism: A critical approach to comparative education in the era of globalizations). In M. W. Apple, G. Whitty, & A. Nagao (eds) 批判的教育学と公教育の再生 [Critical Studies of Education and the Struggle for Public Schools: Contesting Neoliberal Education Reform and Beyond) (pp. 117-146). Tokyo: Akashi shoten (in Japanese). Takayama, K. (2016) Book review, Learning from Shanghai: Lessons on achieving educational success. Comparative Education 52(2): 268-270. Takayama, K. (2015) Book Review, Asia as method in education: A defiant research imagination. Comparative Education 51(3): 468-471. Takayama, K., & Sung Y. (2014) Book review, Re-evaluating education in Japan and Korea: demystifying stereotypes. Asia Pacific Journal of Education 34 (2): 249-252. Takayama, K. (2013) Book review, PISA, power, and policy: the emergence of global educational governance. Comparative Education 49 (4): 539-542. Takayama, K. (2010) Book review, The history of modern Japanese education: Constructing the national school system, 1872-1890. Asia Pacific Journal of Education 30(2): 243-247. Takayama, K., & Kang, H. (2012) Tokdo/Takeshima island dispute: A call for educators to act towards mutual understanding. Asia Pacific Memo # 184. Institute of Asia Research, University of British Columbia (in English, Japanese and Korean). Takayama, K. (2012) National testing in Japan and Australia: To publish or not to publish scores? Asia Pacific Memo #149. Institute of Asian Research, University of British Columbia (in English and Japanese). Takayama, K. (2012) How Finnish, no East Asian education became a global reference. Asia Pacific Memo #132. Institute of Asian Research, University of British Columbia (in English and Japanese). Takayama, K. (2011) OECD's PISA, media sensationalism, and education reform in Japan. Asia Pacific Memo #47. Institute of Asian Research, University of British Columbia (in English and Japanese). Mar. 2017 Highlighted Presidential Session Contesting Coloniality: Re-thinking Knowledge Production and Circulation in the Field of Comparative and International Education,Comparative & International Education Society, Atlanta USA. Mar. 2017 Highlighted Presidential Session Problematizing Comparison, Comparative & International Education Society, Atlanta USA. Oct. 2016 Keynote, International Education Development Forum, Seoul National University, Seoul South Korea. June, 2016 Keynote, Japan Curriculum Studies Association, Kagawa University, Japan (in Japanese). June, 2016 International Symposium Japan in the Global Context of Educational Knowledge: Towards Critical Re-examination of PISA, Institute of Global Concern, Sophia University, Tokyo, Japan (in Japanese). May, 2016 Theory Workshop, Australian Association for Research in Education (AARE) & Griffith University, Brisbane, Australia. Jan. 2016 Public Lecture, Graduate School of Education, University of Tokyo, Japan (in English and Japanese). Dec. 2015 Keynote, Asia and Education Conference, Asian Migrations Research Theme, University of Otago, Dunedin, New Zealand. Dec. 2015 Public Lecture Series, Division of Humanities, Asian Migrations Research Theme & University of Otago College of Education, Dunedin New Zealand. June, 2015 Public Lecture, Research Centre for Educational Development, Kyung-Hee University, Seoul, South Korea (in English). June, 2015 Public Lecture, Gyeonggi Institute of Education, Suwon, South Korea (in English). June, 2015 International Symposium New Paradigm of Education for Longevity Society, Department of Education, Chonbuk National University, South Korea (in English). April, 2015 Public Lecture, National Institute of Education, Nanyang Technological University, Singapore. April, 2015 Public lecture, Head Foundation, Singapore. March 2015 Public Lecture, National Institute of Education, Nanyang Technological University, Singapore. Dec. 2013 Symposium Knowledge of/in ‘Japan’ in an Era of Globalization: Perspectives from Sociology, Anthropology and Japanese Studies, International Centre for Japanese Studies, Tokyo University of Foreign Studies, Japan (in Japanese). Nov. 2013 Symposium Comparatively Rethinking 'Shadow' Education in New Times, Research Division of Japan Comparative Education Society and Department of Education, Sophia University, Tokyo Japan (in Japanese). Aug. 2013 Symposium Globalizing Education in an Asian Century: An Australian Perspective, School of Education, University of Queensland, Australia. May, 2013 Public Lecture, Graduate School of Education, University of Tokyo, Japan (in Japanese). May 2013 Open Seminar, Research Institute for Higher Education, Hiroshima University, Japan (in Japanese). April 2012 Keynote, SSTAR (Staff & Students Talking about Research) Autumn Conference, School of Education, University of Newcastle, Australia. 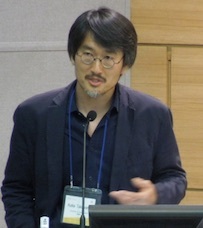 Nov. 2011 Keynote, Korean Societies of Curriculum Studies & Graduate School of Education, Kyung-Hee University, Seoul, South Korea. Aug. 2011 Symposium Overseas Curriculum Research and Teacher Education, Japan Curriculum Research & Development Association & Graduate School of Education, Hiroshima University, Japan (in Japanese).